The Perth Mint of Australia will soon release the 2011 Silver Kookaburra coins, which feature a fresh interpretation of the native bird. The 99.9% pure silver coins will be available worldwide in three different bullion weights starting on September 14, 2010. The reverse of the 2011 Australian Silver Kookaburra features an depiction of the bird on a tree stump with wings outstretched. The Kookaburra is a native Australian bird that is known for its distinctive call, which resembles human laughter. The Perth Mint’s “P” mint mark appears near the stump. Inscriptions “Australian Kookaburra”, the date “2011”, the bullion weight, and purity “999 Silver” appear surrounding the image. The obverse of the coin features a portrait of Queen Elizabeth II with inscriptions “Elizabeth II”, “Australia”, and the legal tender face value. Coins will be available in 1 ounce, 10 ounce, and 1 kilo sizes with each coin presented in an acrylic capsule. The 1 ounce coins have a maximum mintage of 300,000, while the other coins do not carry a mintage limit. The specifications for each coin are shown below. 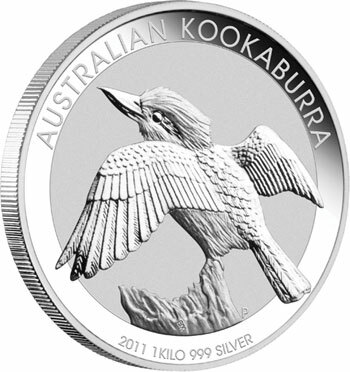 The Silver Kookaburra has been issued by the Perth Mint each year since 1990 with a new reverse design prepared annually.